Completing stupid challenges using overly-clunky rideshare bikes is a growth industry, but one man may have just out-Citibiked everyone. Former corporate event planner Jeffrey Tanenhaus found himself bored of cubicle life in New York, deriving pleasure only from his daily Citibike commute. As described in an interview with DNA, Tanenhaus finally said “all right, let me give this a go, see how far I can get”. “This” turned out to be pedalling a Citibike across a continent: three thousand miles from New York to Santa Monica, all on a 45lb bike with two-inch tires and three very cranky gears. 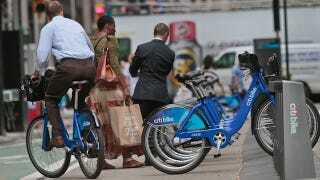 It wasn’t even cheap: rather than applauding his publicity stunt, Citibike fines Tanenhaus the maximum $1,200 late return charge, plus taxes. He probably should have taken a page from the book of bikeshare stunters in London: back in 2013, a group took an identical “Boris Bike” from a station in Southwark, underneath the Channel Tunnel, and then up classic cycling landmark Mont Ventoux in France. Their trip only cost £2, because they managed to get there, up, and back in the space of 24 hours.